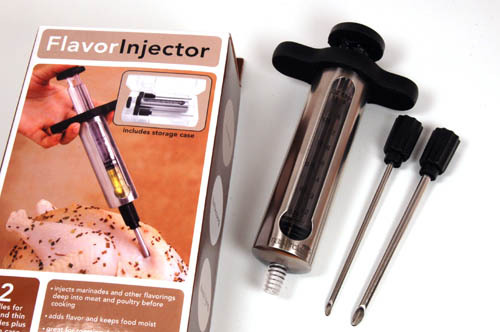 I picked up this injector tonight at Bed Bath & Beyond. The quality is impressive at $12.99. The reservoir is acrylic that is wrapped in stainless steel. The capacity is 1.5 oz, and the thing is pretty hefty for its size and appearance. One of the standout features of this injector is the dual needles that have a single opening at the tip. The larger of the two needles has an opening that is probably 3/32" wide, which makes it perfect for injections that have larger grains, or are more viscous. It also has no small gaskets or other parts to lose, and it's dishwasher-safe. Click the image to get a better view. I have been on the lookout for a quality inexpensive injector and I think I've found it. It even comes in a very cool case. You can see a picture of the case in the upper-right corner of the box. Note: On the packaging it says "Made Expressly for Bed Bath & Beyond", so I don't know where else it might be available. Afterthought: Isn't that bird on the box hideous?! How hard is it to get a good picture of an uncooked and properly seasoned chicken or turkey? I was hoping you found the product to be useful, practical, anything good at all? Did it hold up for the season, meet your expectations? Re; afterthought, yes the bird on the box is hideous!